One CEO panelist whose company runs 20 mm sq ft of retail also owns 30 mm sq ft of office space. He’s optimistic: he notes the smaller oversupply problem compared to prior recessions, and faster speed of price adjustments. For the most part, I agree. 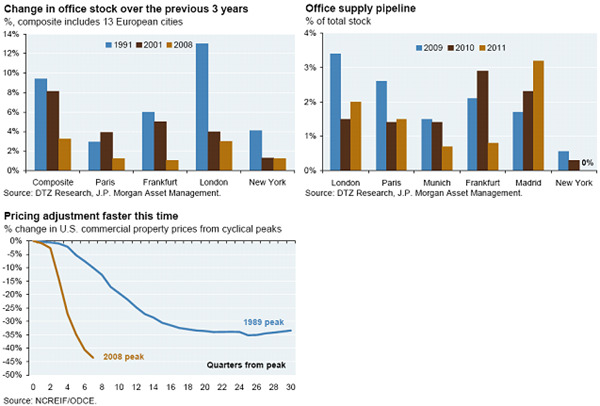 The first two charts below show that compared to two prior cycles, less commercial property was added, and that the pipeline as a % of the existing stock is low (exception: Madrid). The third chart shows the rapid speed of price declines this time around, compared to the 1991 real estate recession. So both arguments are supported empirically. Some context, however: in the U.S., over-supply conditions of the early 1990s were a by-product of changing tax rules. The 1981 Economic and Tax Recovery Act allowed the use of accelerated depreciation on commercial property, and the offset of active income with passive losses. This created a building glut, then rendered useless when the 1986 Tax Reform Act scaled back these tax advantages. As a result, we wouldn’t expect the same degree of over-supply today. But still, the combination of price declines already in place, a slow but gradual economic recovery and a smaller supply overhang argue for some property exposure in portfolios. Another positive: for better or worse, the vast majority of maturing commercial real estate loans were rolled in 2009, whether owed to banks, insurance companies, or CMBS trusts, and often without new equity contributed.